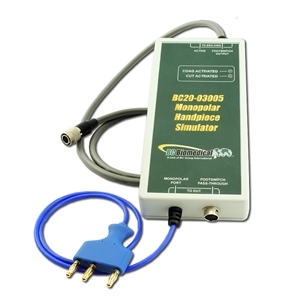 The Monopolar Handpiece Simulator is one of the newest accessories for the ESU-2400 Series of electrosurgical unit analyzers and the only one of its kind. This accessory simulates a monopolar electrosurgical handpiece with cut and coag buttons. This simulator enables automation of monopolar output activation using the footswitch output of the ESU-2400 while providing a passthrough connector for triggering the generator using the footswitch port. Some compatible models include the Conmed System 5000 or 2450, the Coviden ForceTriad or ForceFx and Bovie generators.